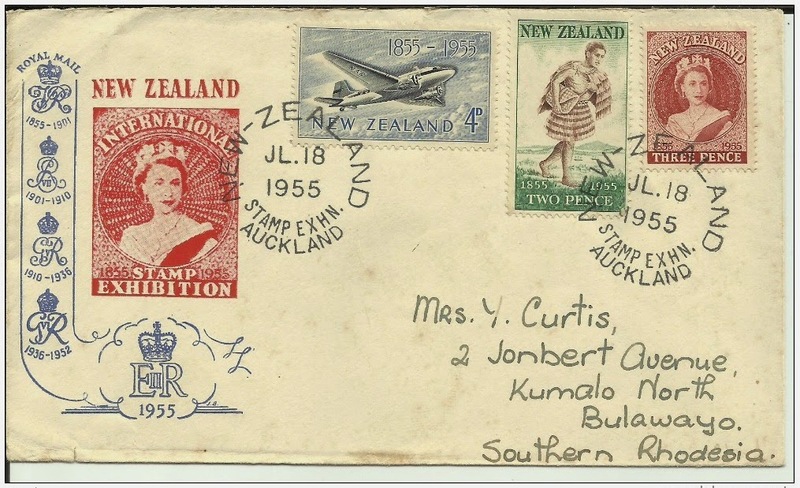 This set has already been shown on this blog, in our post - 2005 - 150 Years of New Zealand Stamps, but considering the importance of this issue to the history of New Zealand Stamps, we felt it deserved its own page. I believe the clever way these three stamps were designed is often overlooked by collectors in their search for more attractive and exciting stamps. I hope this page below might go some way to correcting this. This 1955 issue featured the three values shown above. 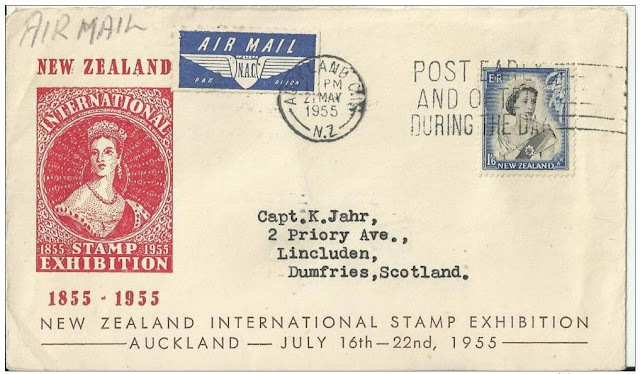 While appearing to be simple designs, I will show you below that some thought has gone into them, cleverly linking the stamps and postal system of 1855, with the stamps and postal system of 1955. 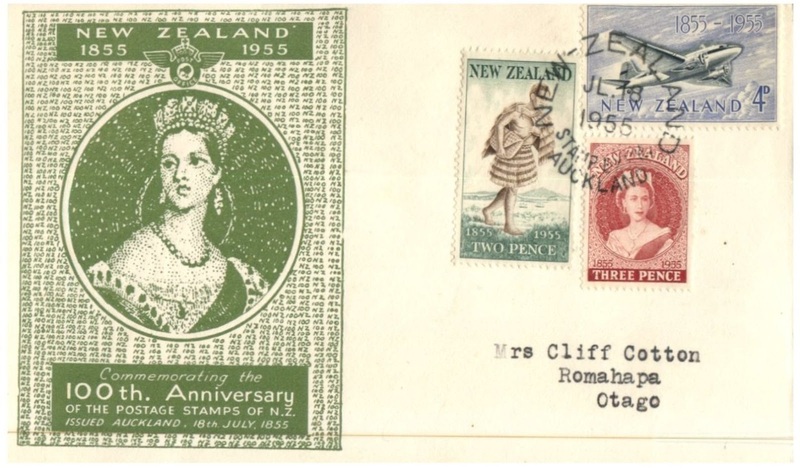 Designs of three of the most famous designers of New Zealand stamps were selected. 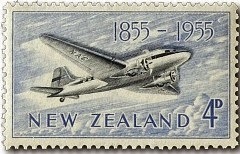 R M Conly's design depicting a Maori Mail Runner was used for the 2d stamp, J Berry's design depicting Queen Elizabeth II in a style similar to that of the first New Zealand stamps was selected for the 3d stamp and A G Mitchell's design depicting an aircraft in flight appeared on the 4d stamp. Three famous designers, another claim to fame for this often under-rated stamp issue. 3d - Queen Elizabeth II. First, we will look at James Berry's design of the 3d value showing the portrait of Queen Elizabeth II. In this design 100 years of stamp design has been brought together onto one stamp. If you look at the three stamps below, on the left can be seen the classic design of the first postage stamps issued by New Zealand, the 1855 - Full-Faced Queens showing a young Queen Victoria. 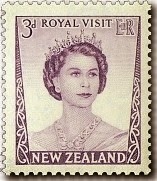 On the right can be seen the more modern design of a stamp issued for the 1953 Royal Visit of Queen Elizabeth II. 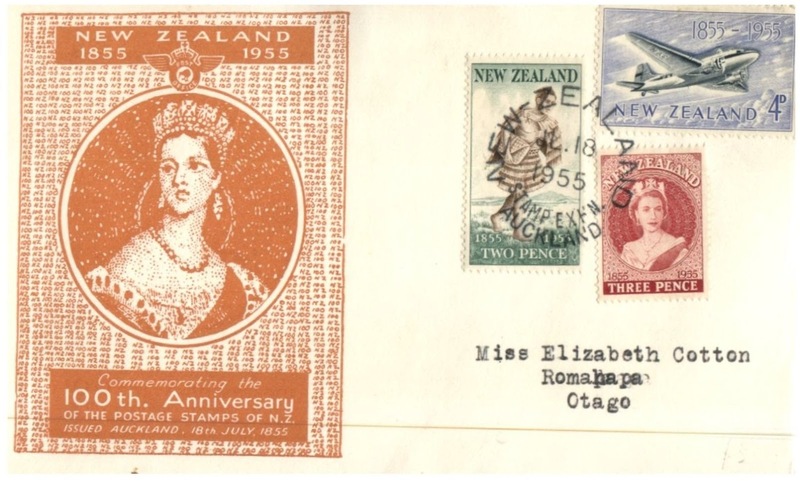 Now let's combine details of both these stamps issued approximately 100 years apart, and now we get the stamp in the middle showing Queen Elizabeth II on the classic Full-Faced design. 1855 6d Full-Faced Queen. 3d - Queen Elizabeth II. 1953 3d Royal Visit. 2d - Maori Mail Runner. 4d - Aeroplane. For the other two values of this set, I believe they should be considered together as they actually fit nicely together as a pair. 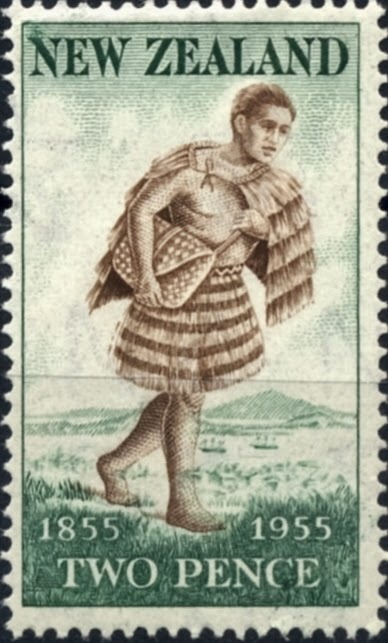 The first stamp is R M Conly's 2d - Maori Mail Runner representing a way mail was transported in 1855. In the background is the township of Auckland in the 1850s with sailing ships in the harbour and the extinct volcano, Rangitoto Island in the distance. Truly a scene of that time. 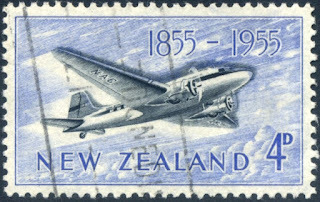 On the other stamp, we have Alan Mitchell's 4d - Aeroplane, a Douglas DC-3 by the looks, that represents mail transport in 1955. 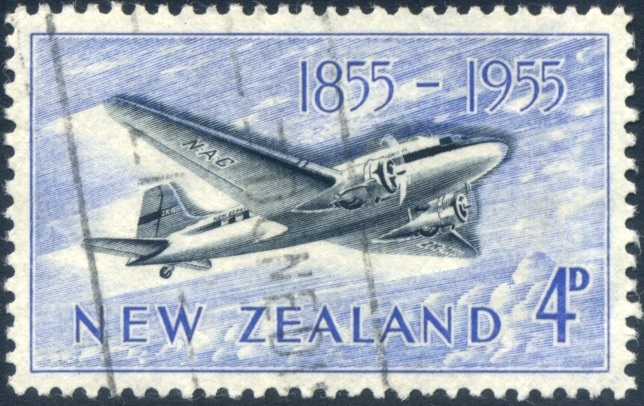 Today we look back at this stamp and the DC-3 is now a vintage aircraft but in 1955 the use of aircraft to carry mail is state of the art when compared to a Maori running with a bag over his shoulder. Again, with these two stamps, we have 100 years of stamp history cleverly shown in these two designs. I think the more classic style of R M Conly on the 2d and Alan Mitchell's modern style on the 4d work well together to feature the centenary theme. First Day Covers - Unofficial. Our first example of an FDC is an unprinted (homemade) cover sent from Nelson to Nelson. Notice the postmark clearly reads 18th July 1955. The sender has also gone to the trouble of writing 'First Day Cover' in the top left corner. Here is another unofficial First Day Cover. Many of these hand-made covers can be found among these earlier issues. First Day Covers - Official. There was a special cover printed for this issue which can be found in at least three different colours as can be seen in the next three covers. 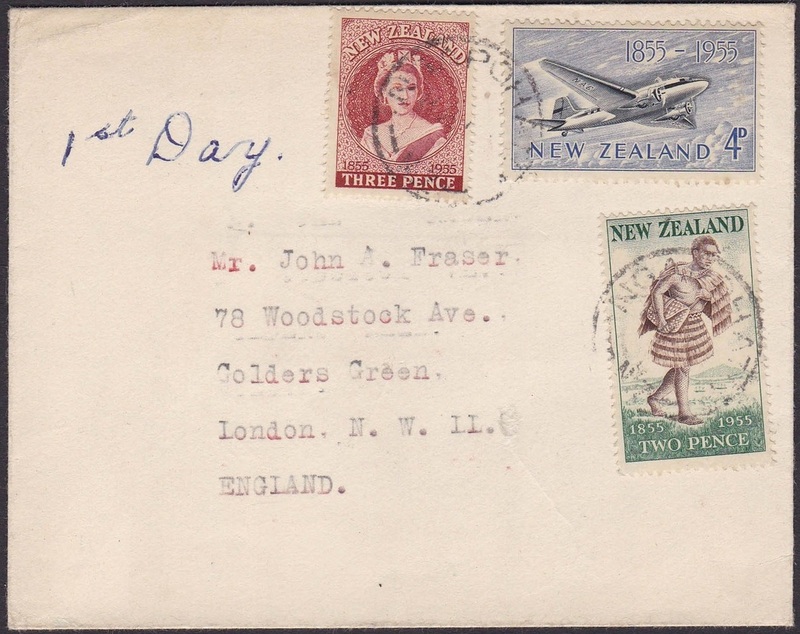 All are First Day Covers being dated 18 July 1955. 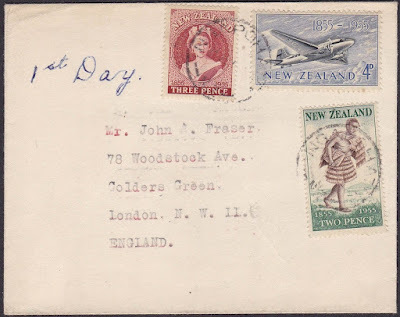 First Day Cover - 18 July 1955 (Blue Cover). First Day Cover - 18 July 1955 (Green Cover). 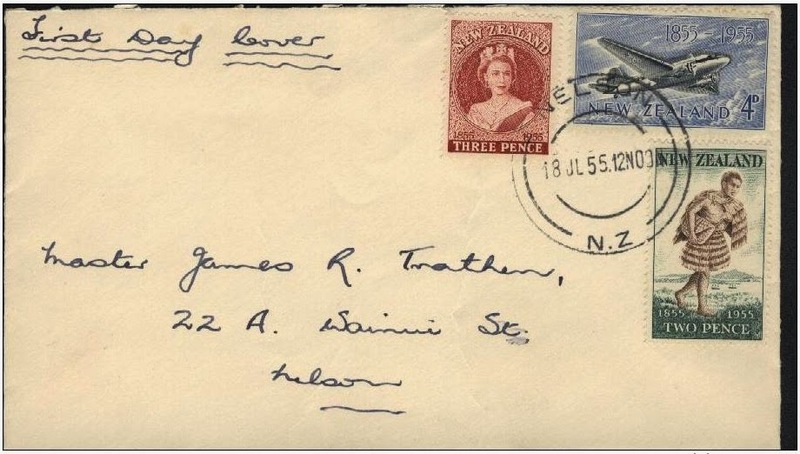 First Day Cover - 18 July 1955 (Orange Cover). First Day Covers - Stamp Exhibition. By far the most common of the covers for this issue. 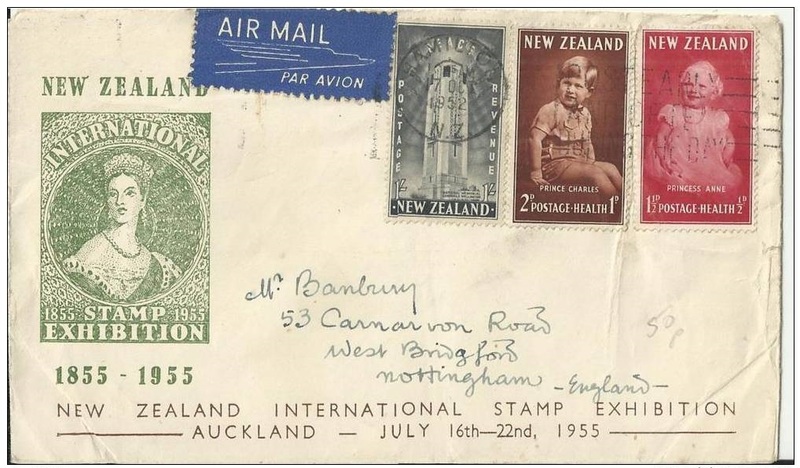 From the 16th to the 22nd of July 1955, there was a Stamp Exhibition held in Auckland. Special covers were printed and a special date stamp made for mail sent from this exhibition. 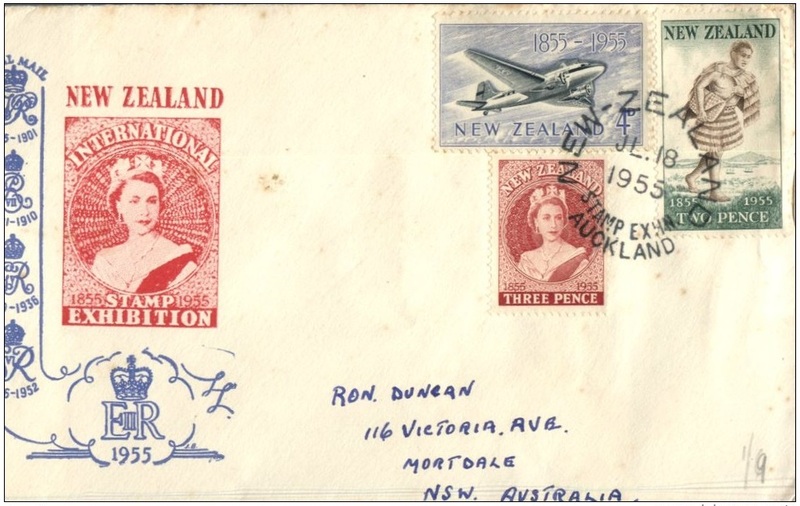 The cover above shows the 1955 Stamp Centenary set with the exhibition cover and cancel. Notice it is also a First Day Cover, having been sent on the 18th of July. Another First Day Cover sent from the exhibition. Our next two covers are a different Exhibition Cover showing a design based on the 1855 Full-faced Queen Victoria. What is also different about these two covers is that they do not have any of the Centenary stamps. The stamps are:- 1/- National Memorial from the 1946 Peace Issue; the two stamps from the 1952 Health issue showing Prince Charles and Princess Anne. 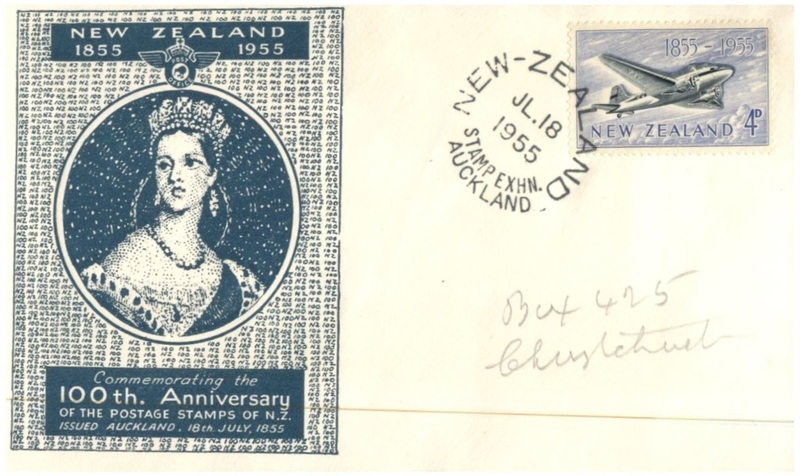 The stamp is 1954 1/6 Blue/Black from the Queen Elizabeth II Definitives. 1995 Exhibition FDC N.A.C. 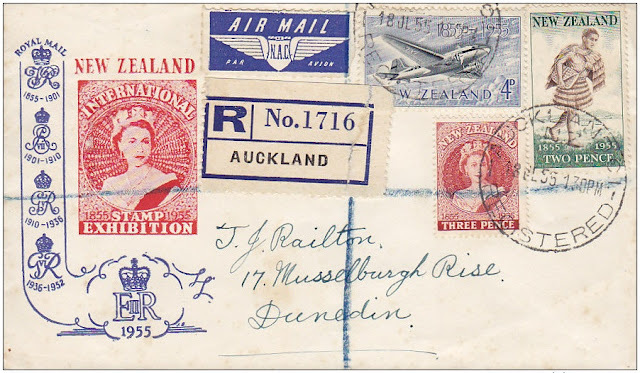 AIR MAIL Par Avion & Registered Labels. I love covers like these, so much going on. 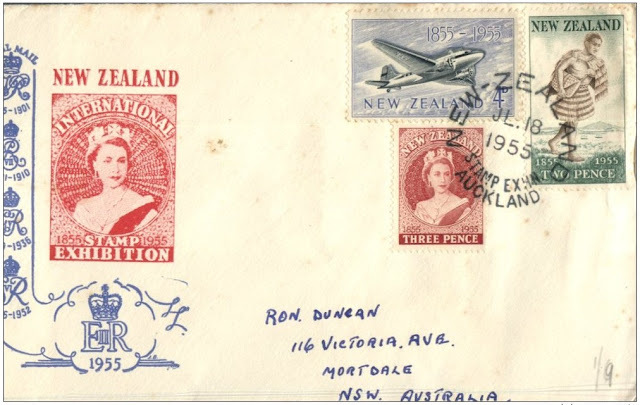 A registered airmail letter to Dunedin using NAC the national domestic airline at that time. Finally, we have a general cover, registered air-mail with the three values in blocks of four. Notice a good example of a USA Customs stamp in the bottom right-hand corner. 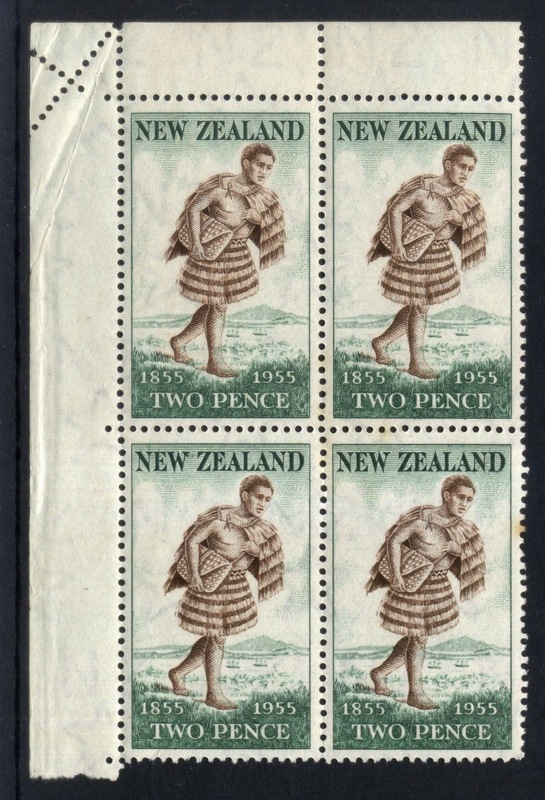 It appears that this Maori running must have been move fairly fast because during designing of the stamp he has begun to run out of the picture. Yes, it's a colour shift in the brown that has moved the runner to the right so part of the green background can now be seen through his front leg. rather unusual effect in the selvage on this block. Evidence of the fold can also be seen as creasing across the corner. 1955 Stamp Centenary 4d with a black colour shift of 2mm right. It appears as more white behind aeroplanes wings plus black outline around the plane. The postmarks show this to be a genuine used copy. Date of issue: 18 July 1955. Designers: R M Conly, J Berry and A G Mitchell. Printers: Thomas De La Rue, England. Stamp size: 2d : 24mm x 40mm; 3d: 24mm x 27mm; 4d : 40mm x 24mm. Sheet size: 2d and 4d: 120 stamps per sheet (two panes of 60); 3d: 160 stamps per sheet. Process: Recess printed - Intaglio. Paper type: Wiggins Teape 'Royal Cypher', multiple NZ and star watermark. Period of sale: These stamps were withdrawn from sale on the 31 August 1957. I did nit realize the connection between 1855 & 1955. I like how you linked the styles between those two designers too. Just saw you posting now. You've given me the word I needed concerning those two designers. Its their "style." I changed this in my text above.